We all know that summertime in Texas is ridiculously hot. Also, we all know that a car sitting under the hot ball of gas that is our sun in ridiculously hot summertime is hot. I’d seen this stunt happen last year during the heatwave, but there was some strange caveat that I honestly don’t even remember, that didn’t make it completely legit. I wanted to try it, and since my cookie recipe makes 54 cookies per batch, I had extra dough hanging out in the freezer waiting to be baked and delicious. FYI, these suckers were completely frozen when I put them on the sheet. 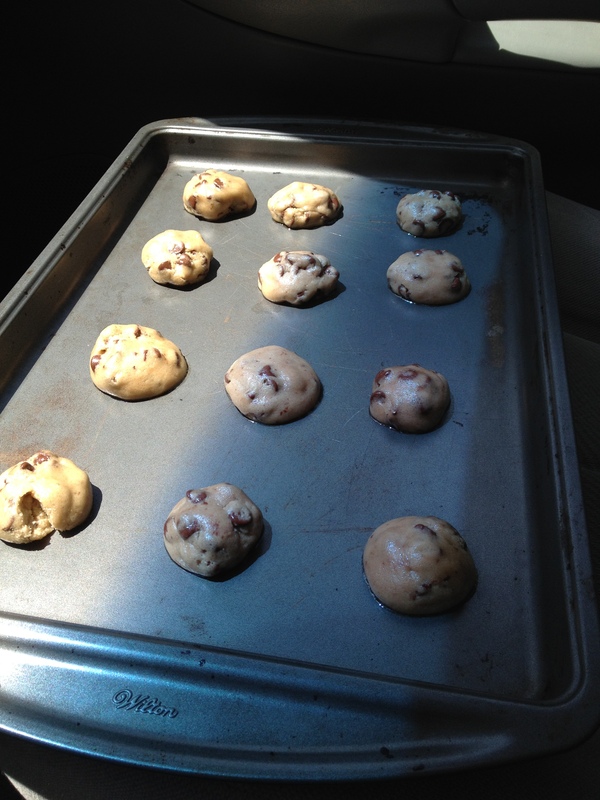 I only made a dozen because in case this crazy idea didn’t work, I didn’t want to ruin too many cookies. I knew it’d take longer than the usual baking time. The one from last year left it in the car from 8-5 during their workday. I checked periodically about every 45 min to an hour, and I think the finishing time was around 5 hours long. Thankfully this was the view from my driveway. I figured the best place to do it was at my own home so passersby didn’t think I was some nut who had absentmindedly remembered to bring the cookies, but leave my coffee in the oven. Nevermind that crack, that would be from the other extreme we get here [ice storms]. When the time came, they didn’t look finished to me because they’re usually larger. 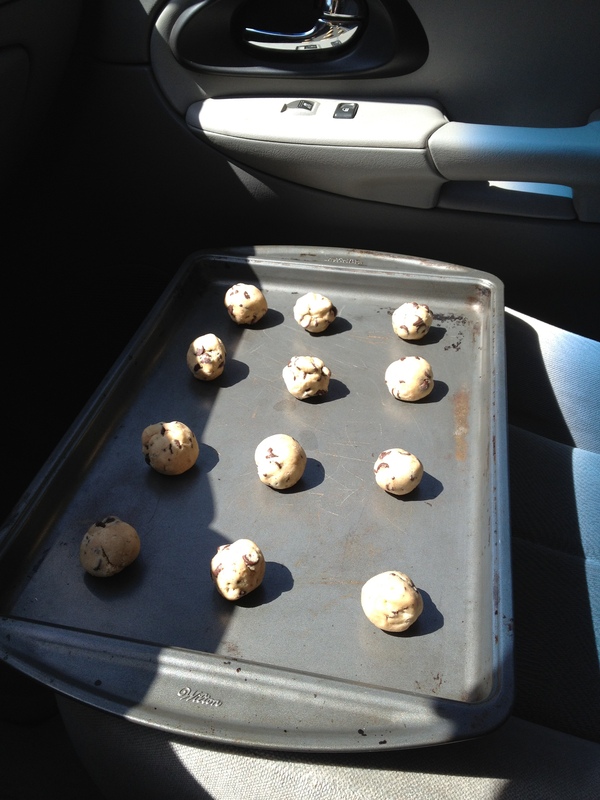 Then I reminded myself that I usually don’t bake cookies in my car. It’s pretty awesome. I wasn’t expecting it to work but it did. We all know how hot an oven can get right? Right. 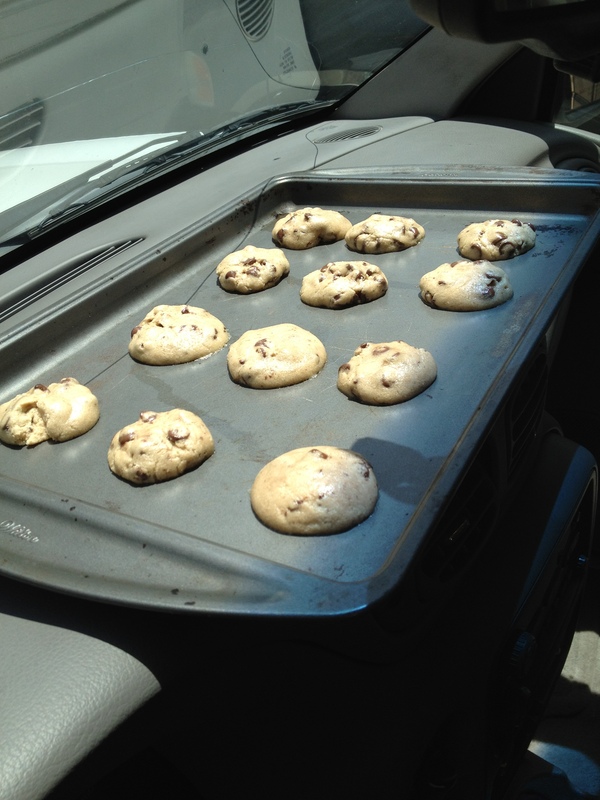 I realize it took longer than the usual 30 minutes to bake those cookies, but my car still did it. 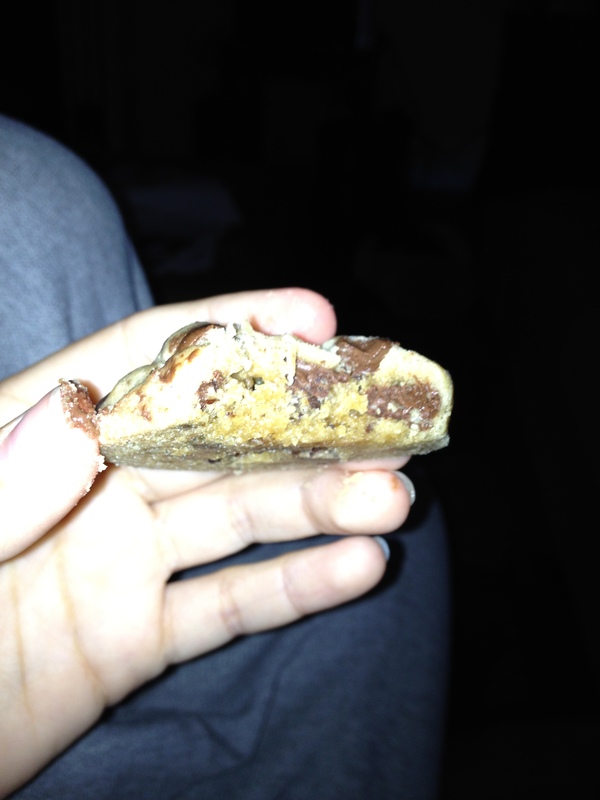 If it can bake a cookie, do NOT leave unattended children in it. That means do not leave them in ovens and by all means in the ENTIRE WORLD do not leave your child in a car, no matter how “quick” you’re going to be. Every second counts, please be responsible. Leave pastries in there, not kiddos. 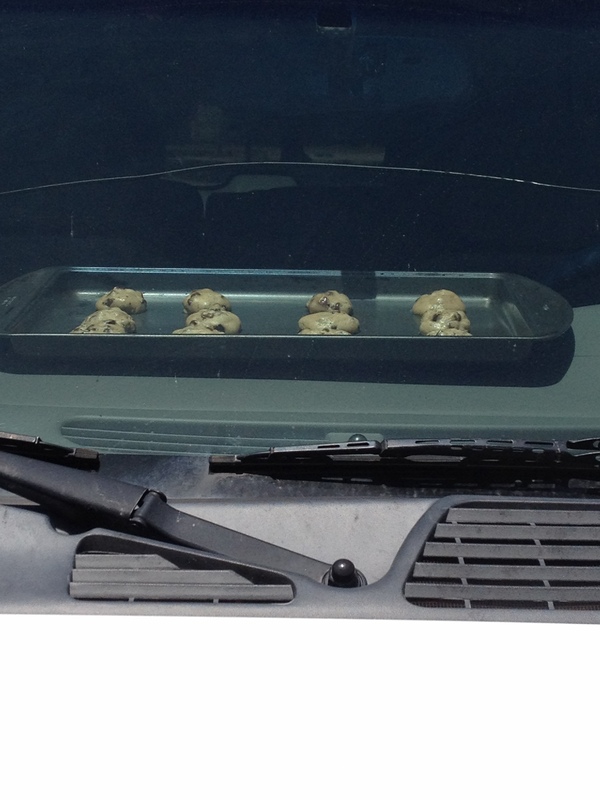 Ok for your next outdoor cooking adventure, try cooking an egg on the asphalt or the hood of a black car…. Just kidding.